With the weather finally brightening up, at least for a few days, it’s the perfect time to pack up your tent, bundle your friends/kids/dog into the car and head off to a campsite for a little break from the outside world. What’s that I hear you cry? 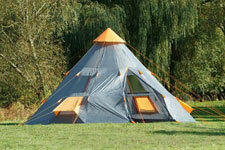 You don’t actually own a tent? Well then, feast your eyes on the list below and see if any of our top picks take your fancy. Before you know it you’ll be singing Kumbaya around the fire. Or maybe not. 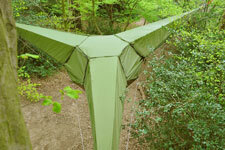 Billed as the world’s most versatile tent and fresh from an appearance on The Gadget Show World Tour, the Tentsile is a mash up of a tent and a hammock, providing a portable shelter that is suspended between three trees, meaning you can rest your head above rocky, wet ground without the fear of waking up with a boulder in your back. With three sizes available, ranging from a two man to a five to eight man option, there is a Tentsile out there suitable for any camper, though scrambling down the rope ladder at four in the morning with a bursting bladder might not be a highlight. For those of you sick of struggling with unruly tent poles, the Vango Airbeam might just be the tent you’ve always dreamed of. There are no rods involved here, just inflatable hoops that keep the structure together once pumped up. 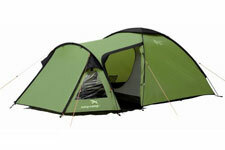 Add in the fact you can leave the inner tent attached and the groundsheet is already stitched in and this could well be the lowest maintenance tent on our list. Plus, it survived Louie Spence’s rigorous ‘wind and rain’ rest on This Morning, which, as we all know, is the ultimate test for any respectable tent. If standing out on the campsite is your kind of thing then you’ll definitely want to check out the tents FieldCandy have to offer. After being featured on both Sunday Brunch and This Morning, you’ll be seeing these attention grabbing tents popping up across every camp and festival site this summer. Featuring almost fifty different options, Field Candy really do stock a design for everybody, with graphics ranging from a circuit board to appease your inner geek to a Cath Kidston-esque chintz for those of you who want to inject a touch of kitsch into your camping. Also highlighted on This Morning’s camping feature, the VW Camper Van tent is an officially licensed replica of the classic VW Camper Van. 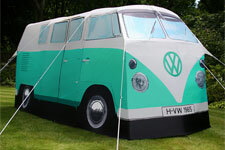 Perfect for fans of the swinging sixties, this is sure to be the grooviest tent in the campsite. There’s plenty going on underneath the bonnet, with two separate bedrooms (each sleeping two people) and plenty of space to stand up inside. 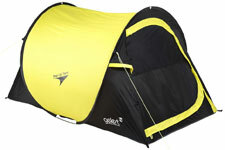 Plus, it’s lightweight enough that the obligatory rock, paper, scissors to determine who has to carry the tent to the campsite is no longer an issue. Bonus! Tesco’s 12 Person Teepee Tent is ideal for bigger groups of campers, featuring one large sleeping area, so this isn’t made for those of you who value your own space. Though, who doesn’t relish the idea of waking up at three in the morning, nose to nose with a drunken chum? The teepee design makes this one extremely easy to put up and the taped seams promise to keep the wind and rain firmly where they belong: outside. Another big positive is the air vents, meaning you won’t roll over in the middle of the night, only to have a shower of condensation and sweat rain down on you from the ceiling. 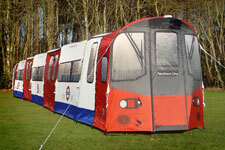 For anybody who wants to combine their love of the outdoors with their love for our fair capital, look no further than the London Underground Tube Tent. Based on a Northern Line carriage, you even get to enter through the driver’s door – what more could you ask for, really? There is plenty of space inside for sixteen campers to sleep, or, for any Londoners who feel a bit homesick; there is standing room for seventy two, which is sure to make the experience a whole lot more realistic. So far we’ve brought you the wonderful, wacky and downright weird tents that are currently on the market for today’s camper but if you’re looking for something a little more sensible, I bring you the Eclipse 300. 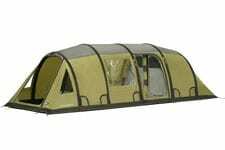 Featuring a spacious sleeping area for three people and a porch for storing your wet, muddy gear, the Eclipse 300 is a reliable, sturdy choice for anybody who shies away from the idea of sleeping in a full sized replica of a VW Camper Van. 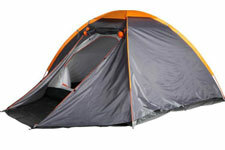 Currently half price, Tesco’s best-selling tent is their 4 Person Dome model. Perfect for newcomers to camping, the tent is lightweight and easy to construct but features everything you need for a good night’s sleep. The groundsheet is built in, saving you even more time and the built-in mosquito netting means you won’t wake up covered in lumps and bumps from any rogue bugs that might find their way into the tent. Plus, it’s an absolute bargain at £14.98*. What’s not to love? The Gelert Pop-up tent was absolutely made for festivals, when the inevitable rain and lack of camping space means you have zero time to mess about with disobedient tent poles and incomprehensible pitching instructions. 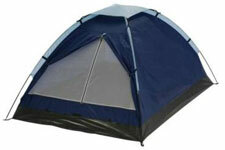 This two person tent can be pitched in a matter of seconds and is just as easy to put down again. While everybody around you is struggling with groundsheets and guy ropes, you’ll be set up and sheltered from the wind and rain in no time. Try not to look too smug, for God’s sake. Let’s face it, tents in the shape of a Northern Line carriage are all well and good but, for a lot of us, price is a deciding factor when it comes to purchasing a new tent and novelty designs often come with a hefty price tag. If you’re looking to save money on your next tent purchase then you might want to consider the Tesco Value 2 Person Dome tent, which retails at a mind-blowing £4.98*. For that price, it’s the perfect back up to combat that horrible moment when you return to the campsite and find only a muddy, trampled shroud of polyester that used to resemble your home for the week.